The national concert industry publication Pollstar has named the St. Augustine Amphitheatre to its list of the 100 top Amphitheatre venues worldwide. The distinction is based on ticket sales reported to Pollstar for shows played between Jan. 1 and Dec. 31, 2012. The St. Augustine Amphitheatre ranked 43. The St. Augustine Amphitheatre is joined on the list by prestigious venues worldwide including Red Rocks Amphitheatre in Colorado, Filene Center at Wolf Trap in Virginia and the Hollywood Bowl in L.A., among others. 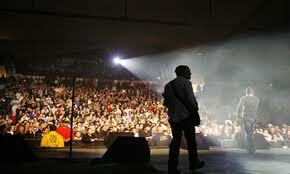 Ticket sales in 2012 for the St. Augustine Amphitheatre reached an all-time high of more than 84,000 tickets. This statistic includes ticketed concert events and does not count the several community events that the Amphitheatre hosted, including Winter Wonderland, Taste of St. Augustine, VELOfest, The National Symphony Orchestra of Cuba, Back to School Beach Fest or the multiple high school and college graduations held at the Amphitheatre. The St. Augustine Amphitheatre is owned and operated by the St. Johns County Cultural Events Division. Scheduled events for the 2013 season include Daryl Hall and John Oates, Matchbox 20, Alan Jackson and Chicago.